Would you describe your school as a ‘thinking school’: one that highlights the importance of critical thinking as an essential part of learning? Too often we hear dismay over a school system that values grades over growth and product over process. 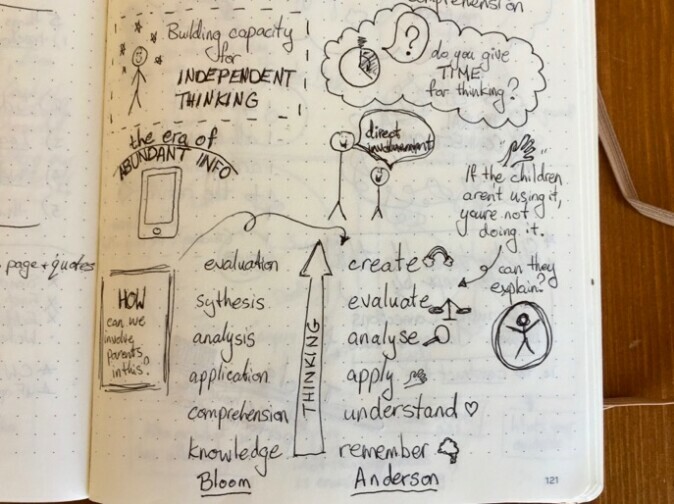 So, when I recently attended a ‘Thinking Maps’ training day I listened with interest to the stories of schools who use tools to explicitly highlight the thought processes involved in learning. You may be familiar with Bloom’s taxonomy – a structure for examining the hierarchy of thinking skills. Anderson’s framework adopts a similar structure, but with some more child-friendly verbs. Teaching this sequence enables children to have ownership of their learning: to be aware of their thinking processes and have the words to talk about this. The intention with Thinking Maps is to establish a shared visual language for critical thinking. I’ve always been interested in how sketching provides a visual hook for conversation. As much of my work involves talking, it’s useful to establish a visual structure during conversations, to clarify our focus and capture offhand comments to return to later. Even in their scruffiest form these sketches serve as a valuable visual record of a session, which I often refer back to in conjunction with my formal case notes. 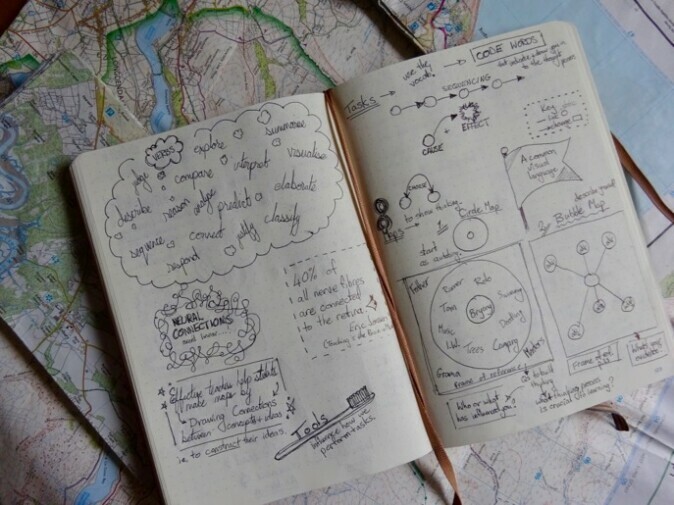 Thinking Maps consists of 8 key structures that encapsulate key thought processes: gathering ideas, comparing, sequencing, categorising and many more. Each map has a corresponding hand gesture; a seemingly small detail with great value. Within our large group discussions the hand gestures were a useful way for the leader to cue us in to the focus of discussion and it was a quick way for the learners to demonstrate their own thinking. So, how will I apply Thinking Maps to my own practice? Well, the course suggested introducing each of the maps with an autobiographical element. I certainly using autobiography tools (like ‘Your Perfect Day’) to get to know children and understand their priorities and motivations, so I can see this fitting neatly in to my practice. I’ll certainly use the sequencing map to support work on narrative skills. I’m excited by the potential of using large pieces of paper for some of my smaller children, to use real objects in conjunction with the maps. The course facilitator suggested that this type of visual language could be introduced at any age, so I plan to experiment and explore its potential. Huge thanks to Gaby Harris, a fellow SaLT, for organising this event with Thinking Schools International. Earlier this year I attended a Social Thinking conference. I left feeling fired up about the potential of this approach to develop social understanding. In fact, I wrote all about it here. Since then, I’ve been applying the principles to my everyday work with children from three to thirteen. It has been an exciting shift from merely teaching social skills to helping children develop their social understanding. 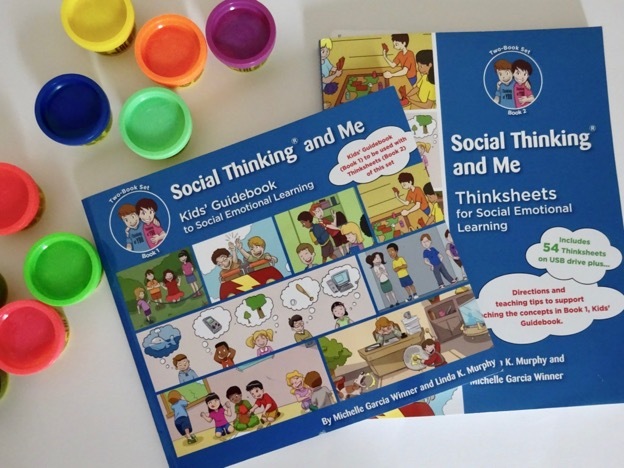 So I was delighted when Social Thinking contacted me about reviewing their latest resource: “Social Thinking and Me”. The Thinksheets hold a wealth of activities for adults to work through with children. It was a conscious decision to call these ‘thinksheets’, in order to emphasise that these are intended to be done with an adult, rather than independently by a child. 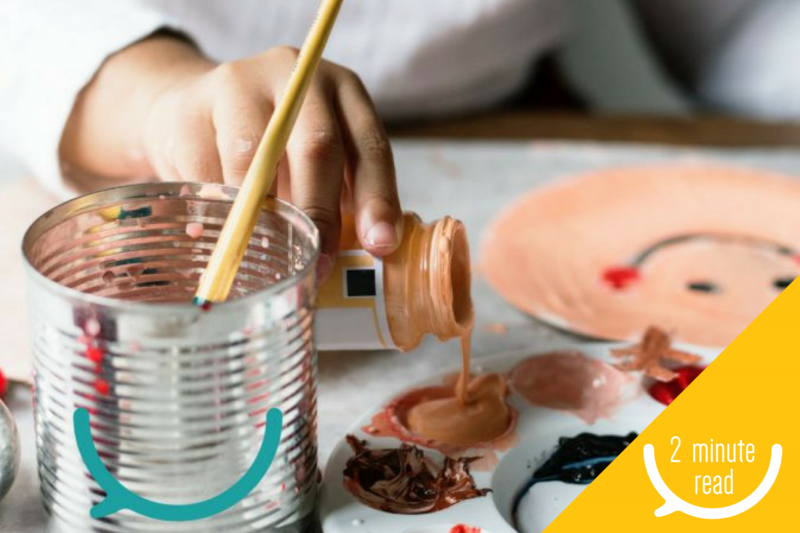 The independent part of the process comes with the Kids’ Guidebook, intended to give children the opportunity to revisit ideas in their own time, at their own pace. A number of my children have commented on how they like ‘quiet time’ to think through ideas, so this format is ideal. 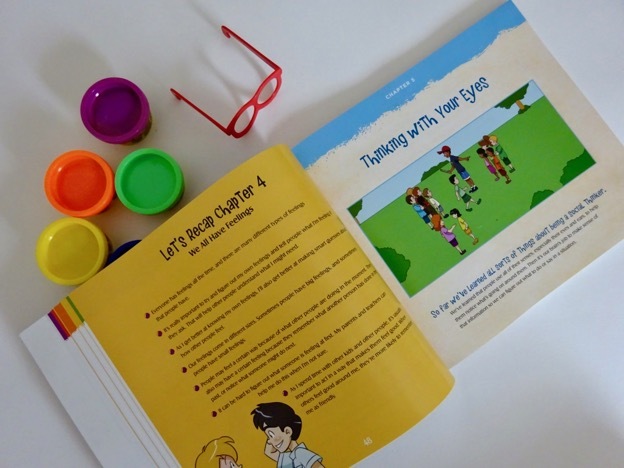 The Kids’ Guidebook lays out the Social Thinking Vocabulary through detailed explanations, picture examples and one-page summaries. This combination of formats makes it accessible for a variety of children. I’ve noticed that those with low literacy levels are interested in exploring the cartoons, providing a great opportunity to discuss ideas together. I’m currently using this resource in 1:1 home sessions and in schools. I’ve found it a flexible tool as I can dip in to the relevant chapters for each individual therapy programme. The layout makes it possible to use as a more structured programme for intervention, giving potential to be used by a variety of adults who support children in this area. If you live in the UK, I can happily recommend ‘Thinking Books’ online shop. I like to buy books from smaller retailers, particularly as they so often have a passion for their topic. The team at Thinking Books are no exception! Will signing stop my child from talking? What is Developmental Language Disorder? 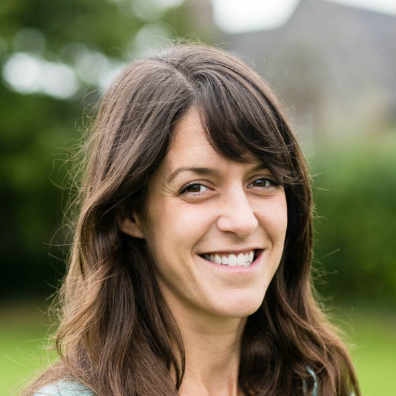 I'm Bryony, and I care about helping children communicate better.